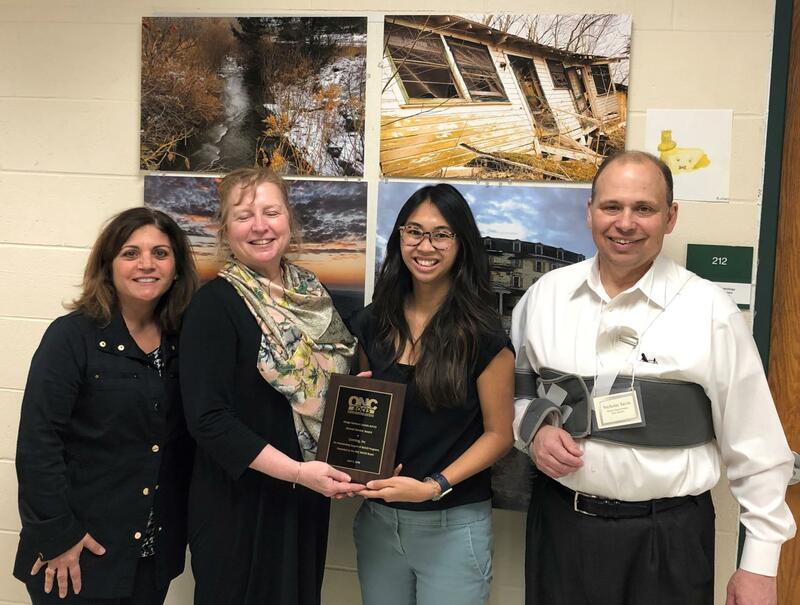 The ONC BOCES Annual Dinner took place on April 9, 2019 at the Northern Catskills Occupational Center in Grand Gorge. This dinner brings together board members and administrators from our nineteen component school districts to learn about ONC BOCES programming, initiatives and the upcoming year's budget. The event is catered by our culinary arts students. At the event ONC BOCES presents Annual Service Awards to one organization and one individual who have supported BOCES programs and students. This year the business award went to Corning, Inc., who has supported both our Engineering program and our new Mechatronics program, opening Fall 2019. They have provided grants, served on advisory committees and welcomed students to their facility in Oneonta. Lizbeth Parent, Oneonta Plant Manager, and Samantha Garcia, HR Manager in Oneonta, accepted the award (pictured). Nancy Barton, of the Prattsville Arts Center, was awarded the individual award. She has supported our Visual Arts and Communications program in a number of ways including hiring students, providing class instruction, providing a venue to display student artwork and donating time to proctor exams.